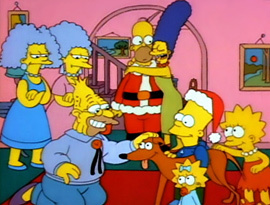 It's a not-so-merry Christmas for the Simpsons when Mr. Burns decides to cut the Christmas bonus. Homer takes a second job as a mall Santa in an attempt to save the holiday. 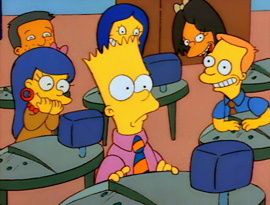 Bart switches papers with class nerd Martin during an intelligence test at school. The school psychologist refers Bart to a new gifted school where he feels out of place. Homer is fired from his job as technical supervisor at the Power Plant. Unable to provide for his family, he contemplates ending it all until he discovers a new passion for safety. 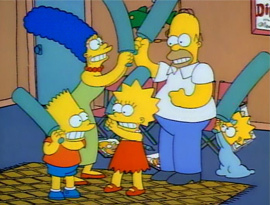 Homer wonders if his family is too dysfunctional and enrolls them in family therapy. Dr. Marvin Monroe attempts to cure them with unorthodox psychiatric methods. Bart becomes Nelson's latest school bullying target. Grampa Simpson and Herman rally the town's children into fighting back against Nelson and his cronies. 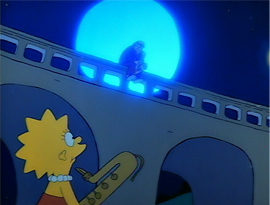 Lisa meets jazz musician Bleeding Gums Murphy who helps her cope with the blues. 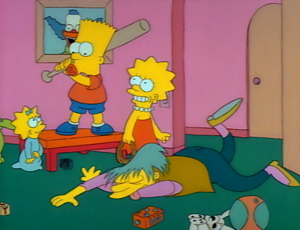 Meanwhile, Bart and Homer duke it out in video game boxing. 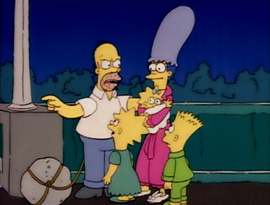 The Simpsons are lost in the woods on a camping excursion. 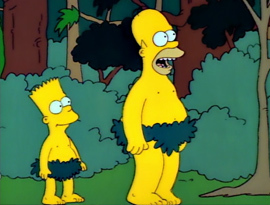 Bart and Homer lose all their clothes while Maggie cuddles up with a family of bears. 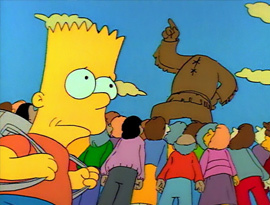 An angry mob is after Bart when he cuts off the head of Jebediah Springfield's statue in an attempt to impress his peers. Marge takes bowling lessons after she receives an unwanted bowling bowl from Homer for her birthday. Love blossoms on the lanes when her instructor expresses feelings for her. Bart uses a spy camera to take a picture of Homer with a belly dancer at a stag party. 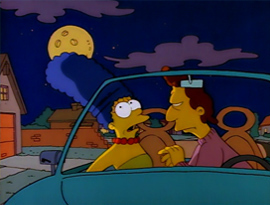 The picture is seen by all of Springfield, including a very upset Marge. The result of a bad prank sends Bart to France as part of a foreign exchange program. 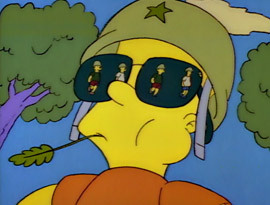 The remaining Simpson family must care for an Albanian boy while he is away. 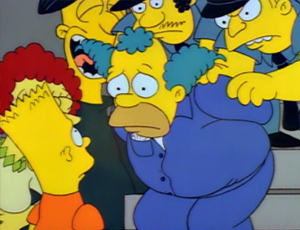 Homer witnesses a robbery at the Kwik-E-Mart and identifies Krusty the Clown as the culprit. 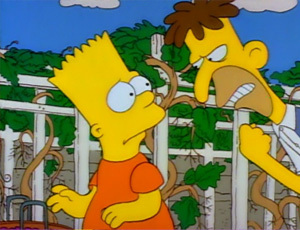 A disbelieving Bart seeks Lisa's help in cracking the case. While Homer and Marge are out on a romantic evening, the kids are left with a wanted bandit as their babysitter.